Costner and Keanu are back in Part II! One of Kathryn Bieglow's most inspired decisions (in a long list of inspired decisions) may have been to shoot Point Break like a romance. It is a romance, after all: It's romantic about surfing, about friendship, about the search for the ultimate rush. Its two leads, Johnny Utah (Keanu Reeves) and Bodhi (Patrick Swayze), seemingly opposing forces, are so in love it would make John Woo blush. That love is crucial. They have to take each other seriously. It has to be serious if it's going to work; it's a tale of bank-robbing surfers, after all. And while Point Break absolutely approaches the ridiculous, it never winks at itself. It never takes the easy, ironically detached way out. That's what makes it great. 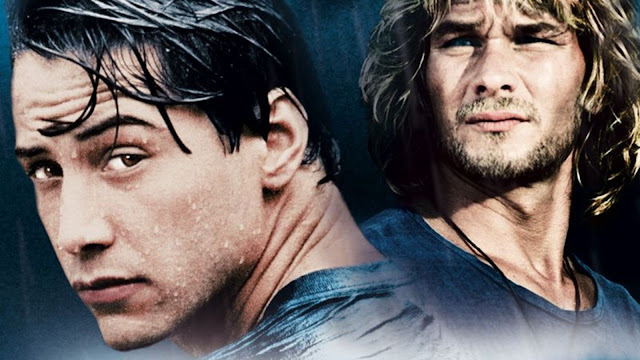 Much has already been written about Point Break's approach to masculinity, but it's worth noting that Johnny Utah lacks the moral authority usually afforded to action heroes. Bodhi's lifestyle makes him feel free and alive in the way that police work never will (Gary Busey and John C. McGinley's aggressive hypercops contrast perfectly with Swayze's laid-back school of Zen). It's easy to see Utah as a useless and reactive character (he really is a bad cop), but rather than punishing him, the film turns that failure into an interesting examination of what going "undercover" actually means. He's a bad cop because he isn't really a cop at all, at least not in his heart. He's stuck in a box following orders when he'd rather be skydiving with Bodhi and making time on the beach with Taylor (Lori Petty). Let's talk about Petty for a second. If this were a story about the True and Ultimate Supercop Johnny Utah, Petty's mousy androgyny would be the wrong approach to a love interest. She's got a tough, grating voice and a quick trigger finger. But Utah's journey is all about seeing the forest for the trees and he needs a real and tangible gun moll if he's going to come clean and be honest with himself about his true identity. Sure, she's eventually reduced to damsel in distress, but rescuing her gives Utah a threshold to cross and forces him to sacrifice his integrity as a cop to come back from it. But in the end, he can't bring himself to live in that box again. He instead tosses his badge and takes up Bodhi's quest for the next Ultimate Rush. 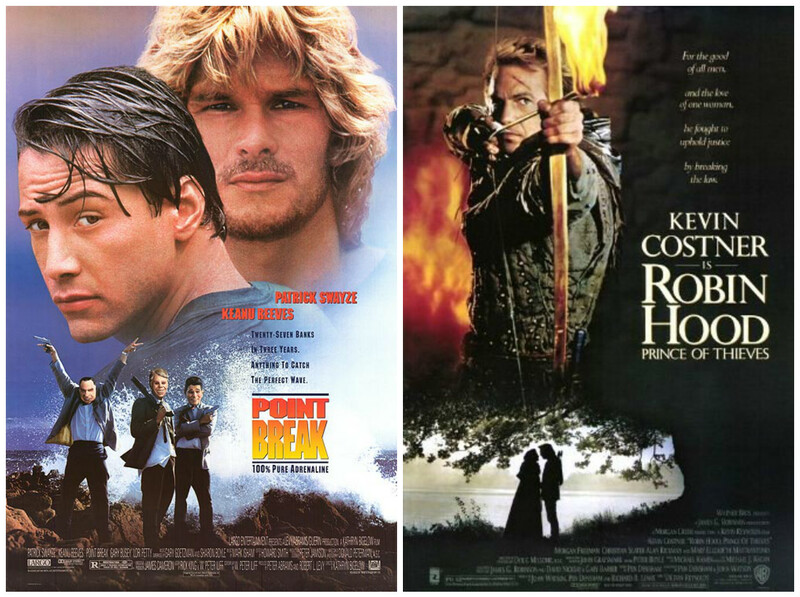 Was Kevin Costner such a big deal in 1991 that he didn't even have to bother with the accent? It seems like a silly thing to obsess over when you consider the sheer tonnage of blech that Robin Hood: Prince of Thieves dumps on us, but did we all just agree not to say anything? Also: Did a 90s audience, naive and untested, consider this a Dark and Gritty adaptation of the classic folk tale? Was Alan Rickman able to properly digest all the arch and ugly scenery after chewing it to goddamn bits? Is there a cut of the film in which his character makes sense? Is he the hero in it? Please tell me he is, because there's nothing else to like in this stilted and awkward mess of a picture. I'm wrong. There's one other thing to like: Kevin Reynolds' direction. He shoots the hell out of this thing, zooming in and out with wide-angle fishbowl lenses. It's medieval legend by way of Sam Raimi. 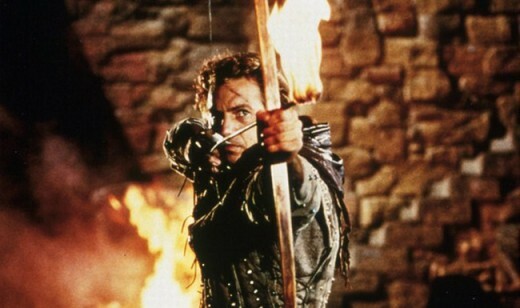 In fact, Raimi would love the bizarre and inappropriate violence that Prince of Thieves revels in. There's amputation, forced eye removal...Hell, Morgan Freeman whips an Ali Baba sword at a devil-worshipping crone in this movie. If there's one thing that makes up for Kevin "Vanilla Fantasy" Costner, it's Morgan Freeman whipping a goddamn Ali Baba sword at a devil-worshipping crone. Anyway, back to Rickman. Rumor has it that he only agreed to be in the film if he could play it however he wanted, and he somehow found a way to make Hans Gruber hilarious. His comic timing is immaculate here. He's a gourmet ham sandwich and I still have absolutely no idea what his plan is. What did he think would happen when Richard the Lionheart came back from the war? Whatever. It doesn't matter. The filmmakers must have known he'd be the film's sole source of humor because aside from Mike McShane's few bits as Friar Tuck, Robin Hood's merry band mostly consists of dipshits and assholes. There are no meaningful character arcs at play in Prince of Thieves. Maid Marion (Mary Elizabeth Mastrantonio) finds Robin charming and all, but is this condescending, morally superior jag really a leader of men? Why does anyone follow him? Making Robin a tortured survivor of the Crusades is a nice touch for realism, but they forgot that there's supposed to be a basic lightness and, well, merriment to Robin Hood that draws those around him to his cause. Worse yet, there are no consistent narrative stakes. The drama peaks and valleys in the most superficial way possible; tensions flare up for a quick second and are then extinguished without much continuity. This is supposed to be an epic tale of man-damning and rabble-rousing, but all they manage are a few interesting POV arrow shots and Sean Connery in chainmail. Oh well. We'll always have Rickman.